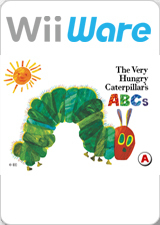 The Very Hungry Caterpillar's ABCs is an activity game based on the children's book The Very Hungry Caterpillar. Young players can learn the alphabet by associating words and pictures with each letter, engage in drawing and coloring exercises, and be introduced to over 140 basic English words. The graph below charts the compatibility with The Very Hungry Caterpillar's ABCs since Dolphin's 2.0 release, listing revisions only where a compatibility change occurred. This page was last edited on 24 January 2018, at 03:12.